Countless adults have them because they weren’t spotted early enough to treat. 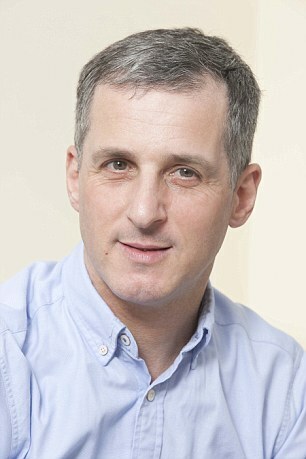 Paul Morland’s sight is good enough for driving but fiddly tasks are all but impossible and if he had wanted a career that required good vision, such as being a pilot or surgeon, he would have been automatically ruled out – because he is effectively blind in one eye. This could have been prevented if Paul’s problem had been spotted sooner. Like at least a million people in the UK, Paul, 50, has a squint (when the eyeballs do not follow each other because the muscles around them do not work in synchronicity). A squint may be obvious, causing the affected eye to turn inwards, outwards, upwards or downwards, when the other eye is looking straight ahead (giving the impression of being ‘cross-eyed’). However, the squint may not occur all the time, and a minor squint may not always be obvious because there is no correlation between the degree of squint and its effect on vision. If left untreated, the affected eye is not used for focusing and eventually becomes ‘lazy’, causing blurred vision. Lazy eye is caused when the part of the brain associated with vision, the visual cortex, ignores messages coming from that eye. Lazy eye can also lead to a lack of 3D vision (which requires input from both eyes), making it difficult to judge how fast objects such as a football are moving. 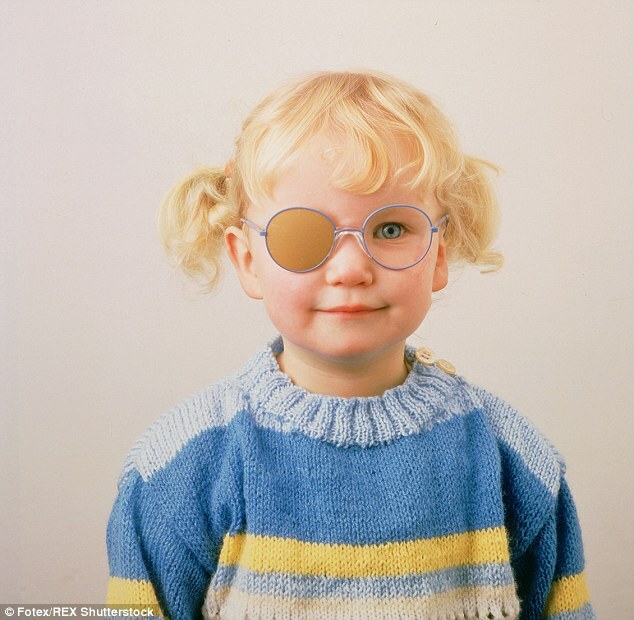 Squint, whose clinical name is strabismus, affects around one in 20 children in Britain and without treatment most of those will develop a lazy eye (amblyopia), the major cause of one-eyed blindness in the under 40s. People under 20 are ten times more likely to lose their vision due to lazy eye than through trauma and disease combined. Treatment usually takes the form of eye patches that encourage the muscles in the lazy eye to work or, in the worst cases, surgery, which involves adjusting the muscles in the turned eye to enable both to work together. The Countess of Wessex recently spoke of how her daughter, Lady Louise Windsor, 11, developed a ‘profound squint’ as a result of her premature birth, which was resolved with the help of surgery. Often the condition does not get picked up until it is too late for treatment to be effective. As Dr Simon Barnard, a London-based optometrist, says, visual development moves on rapidly between the ages of one and five, and treatment after this age has little chance of success. ‘It’s a bit like cement drying – the quicker you start work, the more time you will have before it sets,’ he says. ‘After the age of eight the chances of success are much lower.’ Yet screening of young children is not uniform in this country, partly due to a shortfall in the number of specialist orthoptists trained to pick up such problems in children. Paul’s squint was not spotted until he was five. However, when he was one his mother had concerns about his eyes and took him to have them checked. ‘Squints run in my family, so my mother took me to a specialist. The specialist examined me, but told her there was nothing wrong,’ says Paul, a business consultant and a political scientist who lives in North London with his wife and their three children aged 21, 19 and 16. When he was five, his mother decided to get a second opinion and he was diagnosed with a squint in his right eye – which had by then become ‘lazy’. He was made to wear a plaster over his good eye to try to encourage the lazy one to work, but after two years there was no improvement and Paul was told that his squint had been picked up too late to be helped. ‘I even tried some further treatment in my teens, which took the form of special exercises and trying to read with my good eye covered, but they made no impact to speak of,’ he says. ‘The effect on my sight has been huge: I have a very narrow field of vision and poor 3D vision, which means that I find it hard to judge fast-moving objects and simple tasks like threading a needle are almost impossible. In Britain, babies are currently checked for squints at birth and during the six to eight-week check, usually by a health visitor who will look for symmetry by shining a light in the baby’s eye. At that point, if a concern is raised the child will be referred to a specialist. Most squints are picked up during screening in the first year of school, where tests such as a vision chart are used to assess quality of sight. However, by this time the chance of any necessary treatments being successful is reduced. Furthermore, children’s sight testing in the UK may not be offered in some areas, says Geoff Roberson, of the Association of Optometrists (AOP). He says: ‘Even where screening is provided in schools there are many conditions which, although they may cause significant problems to a child and to their ability to learn, will not be picked up.’ After the first year of school, there is no screening as such. Children can have free sight tests up to the age of 16 (or to under 19 if they are in full-time education), but the onus is on the parents to take their child to an optometrist. Yet, according to the AOP, more than 90 per cent of children visit a dentist regularly while only 53 per cent have ever had an eye examination. A further problem is that parents tend to assume that eye problems will be obvious, but small children often become so accustomed to their level of vision that, even if impaired, it may not be apparent. Around 20 per cent of school-aged children in the UK currently have an undiagnosed sight problem, according to the AOP, which is campaigning to raise awareness of the importance of children’s eye tests. ‘Health visitors do their best, but it is very hard to pick up less obvious squints,’ says Dr Barnard, who has recently developed a piece of equipment which he hopes will make this crucial early detection easier and more accurate. The Volk Eye Check is a hand-held camera that can identify a squint with a single flash photograph. It has a patented child-friendly ‘target’ with coloured lights on the front to draw the child’s focus to the correct area so an accurate image can be captured. The camera software then looks at 17 data points to measure the alignment of the eye. Any lack of symmetry means that the child’s vision should be investigated further. 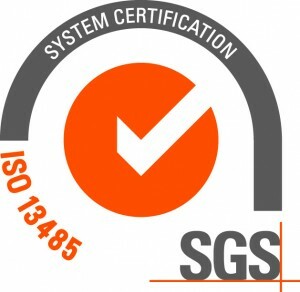 The whole process takes place around two minutes and the test can be used from four months on. Research by the developers on 331 cases found an 84 per cent success rate in diagnosing squints in babies and young children. Furthermore, an independent study recently completed by the Michigan College of Optometry in the U.S. has confirmed the accuracy of the measurements taken in Dr Barnard’s test. 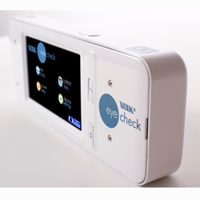 The hope is that it could make low-cost squint screening widely available, possibly carried out by a health visitor. However, it has yet to be picked up by the NHS, although the device is already being used in some High Street opticians. When fitting contact lenses, multiple measurements should be taken to ensure that the proper lens design and parameters are chosen for each patient. While Ks and spectacle Rx continue to be the parameters that manufacturers most commonly build their fitting guides around, there appears to be a resurgence in incorporating additional information such as horizontal/diagonal visible iris diameter (HVID/DVID), pupil size, distance from the lower eyelid margin to the pupil margin, and palpebral aperture size. This is especially critical in fitting lenses for presbyopes. Additionally, sagittal depth/height has become the new buzzword (again), initially in the scleral lens area, but now in many soft lenses as well. Ever since Graeme Young’s (1992) study, it has been demonstrated that corneal diameter has the most influence on sagittal height, so the ability to accurately measure this ocular parameter is paramount. Recently, the new Volk Eye Check Contact Lens (VEC CL) device claims to eliminate the potential error that subjective measurements can cause by taking objective measurements (Figure 1) of the eye and eyelid. Iriss Medical recently closed a round on Seedrs, 197 per cent funded. The company makes an innovative medical device which performs automatic eye tests aimed at the early detection and prevention of lazy eye in children. It raised £491,387 for 4.92 per cent equity. Over the past decade, donation-based crowdfunding has played a reasonably prominent role in helping to fund technological development. DIY robots have been funded on Kickstarter, along with drones and 3D printers. In the US, it has become an alternative go-to for science researchers struggling to get grants. Experiment.com, for example, is a platform devoted to donation-based crowdfunding of scientific projects. It’s backed by Bill Gates, who writes on the website: “this solution helps close the gap for potential and promising, but unfunded projects”. But as the crowdfunding industry has evolved, businesses which have in the past looked to donation-based funding have started offering equity to investors. Iriss is just the latest example. Yet although increasing numbers of tech businesses are turning to equity crowdfunding, provision for research and development (R&D) projects – particularly for firms that are still at the pre-product stage, but also those that are pre-market – is still extremely limited. “You generally see companies that have a prototype or are on a clear path to have a product. The (usually donation-based) crowdfunding supports the commercialisation of the product,” explains Thomas Tanghe, an associate at Space Tec, which last year authored Crowdfunding Innovative Ventures in Europe for the European Commission. “R&D isn’t very application driven generally – otherwise, you’d call it product development,” he adds. This makes offering equity and debentures very difficult – investors aren’t just betting on a high-risk startup, but often on a model with no clear path to revenue generation. One of the reasons crowdfunding as an industry has taken off, Rau says, is that it decreases upfront costs and the cost of monitoring – investors make a direct assessment themselves. Bill Harvey revisits a hand-held device developed to screen the very young for neurological disease and finds it has evolved an expanded repertoire which hints at great future potential. A couple of years ago, I caught up with Dr Simon Barnard who demonstrated to me a new hand-held instrument, the Volk Eye Check, which he had developed as an effective way of screening children, even the very young, for a variety of potential anomalies such as strabismus, anisocoria, partial ptosis and so on. I was impressed at the time by its ease of use, its portability (essentially the unit looks like a smartphone), its apparent sensitivity as confirmed by early work by Barnard, and the way the data was easily analysed and transferrable. At that time, the instrument developed by Barnard with IRISS Medical Technologies was not commercially available, but it was clear that a full blown launch was imminent.